Mumps is a vaccine preventable viral infection. Its typical clinical manifestations are characterized by pain and swelling of the salivary glands, fever, and fatigue. Often other organs are affected - testes in males after puberty (orchitis), ovaries in women (ooforitis), pancreas (pancreatitis), central nervous system (meningities). The use of specific immune prophylaxis led to a significant success in the fight against mumps, but there are still unresolved issues related to the immunological and epidemiological effectiveness of the vaccines. The disease continues to interest researchers today. The main issues being tackled are related to the conduct of virological, clinical and sero-epidemiological studies in different countries. Objectives of the study is to determine the frequency distribution of mumps-specific IgG antibodies in healthy populations in the region of Pleven, Bulgaria. Methods: a cross-sectional sero - epidemiological representative population - based survey in the area was made. 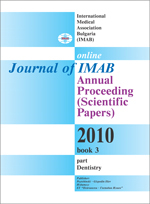 Enzyme immunoassay method was used for an indirect proof of mumps - specific IgG serum antibodies. 410 people were examined at an average age of 25 (1 to 84). Of these, 250 (61 %) were women and 160 (39 %) - men. Results: Of all test results, the negative were 72 (19 %), the borderline were 12 (3 %), the positive were 182 (44 %), and highly positive were 144 (35 %). The vaccination status showed that 242 (69 %) of all surveyed were immunized with a vaccine against mumps. According to the immunization schedule in Bulgaria, 132 (33 %) people were immunized with monovaccine during the years - 1 intake, 80 (20 %) with trivaccine - 1 intake, and 64 (16 %) - 2 doses. Conclusion: We believe that despite the specific immunprophylaxis carried out against mumps decades on end, the necessary level of protection leading to its elimination has not yet been reached. Key words: mumps, seroprevalens, immunprophylaxis.